This annual publication provides details of taxes paid on wages in OECD countries. It covers personal income taxes and social security contributions paid by employees, social security contributions and payroll taxes paid by employers, and cash benefits received by in-work families. It illustrates how these taxes and benefits are calculated in each member country and examines how they impact household incomes. The results also enable quantitative cross-country comparisons of labour cost levels and the overall tax and benefit position of single persons and families on different levels of earnings. The publication shows average and marginal effective tax rates on labour costs for eight different household types, which vary by income level and household composition (single persons, single parents, one or two earner couples with or without children). 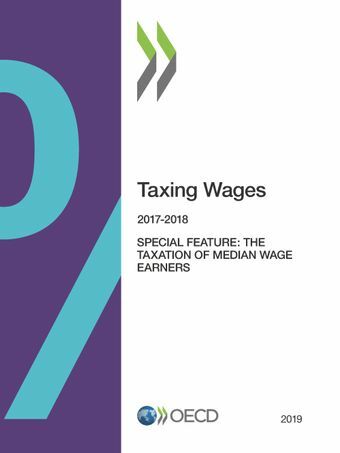 The average tax rates measure the part of gross wage earnings or labour costs taken in tax and social security contributions, both before and after cash benefits, and the marginal tax rates the part of a small increase of gross earnings or labour costs that is paid in these levies.Taxing Wages 2019 includes a special feature entitled: “The Taxation of Median Wage Earners”.